MUSKEGON, Mich. — A Muskegon woman who works two jobs to make ends meet, and has had to walk to work because she can't afford to get her car fixed, received a much-needed new set of wheels, thanks to a chance encounter. Monique Brown works at Acme Cleaners by day and Home Depot by night. "Between the two jobs, I often put in 14 hour workdays," said Brown, 31. "It's been a challenge but I always get to both jobs on time. Brown says since her car recently broke down, to get to both of her jobs, she's had to Uber, inconvenience friends to drive her, or walked. Her luck would turn for the better after she started assisting Muskegon County Commissioner Bob Scolnik when he brought his laundry into Acme Cleaners on the days and hours she was working. "I found her to be super likable," said Scolnik, 74, who just got re-elected last November to a 9th term as a county commissioner. "One day, she started talking to me about the fact that I was now chair of the finance committee for the county with a big budget and that I needed to remember the working people and that struck a chord with me. "Then she proceeded to tell me that her car had broken down and that she had two jobs, but that she still made sure she made it to both jobs on time no matter what." Scolnik, who spent decades owning and operating businesses around the Muskegon area, before retiring and entering politics, says he was very impressed by her dedication to timeliness, despite her struggles. "I sensed a good person in her and I felt the need to help her," said Scolnik. "I decided I wanted to try and get her a new car." On January 8, Scolnik created a post on his personal Facebook page, detailing his plan and officially launching a fundraising campaign. "I said I would match the first $1,000 that was raised," said Scolnik. Over the course of two weeks, donations poured in, including one for $2,500. On January 16, his campaign had surpassed the $7,000 mark. He knew he had more than enough to buy Monique a nice used car. "'I was able to find a private owner who was selling a 2008 Honda Civic Coup, so I bought it," said Scolnik. "I kept asking myself why I was doing this but something whispered to me that I needed to help this lady." On Thursday, January 23, Scolnik picked up the car and took it to Auto Spa in Muskegon for a shine and detail. He even had a huge pink bow put on it, hoping to make it look as close to new as possible. This is how the car looked when Monique Brown saw it the first time. 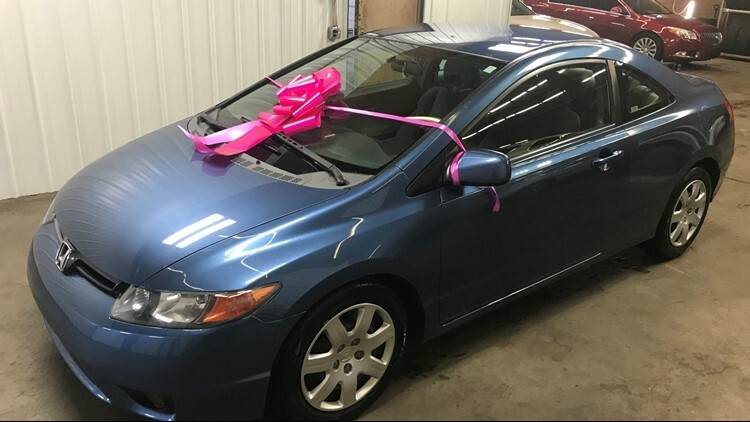 Her 2008 Honda Civic was washed, detailed and had a big pink bow on it. The very next day, Scolnik picked Monique up at her house and brought her to Auto Spa in Muskegon to surprise her with the car. "She had no idea about anything, which made the experience so cool," said Scolnik. When the two arrived, Scolnik has a garage door opener in his possession, given to him by the owner of Auto Spa. He opened the door, with Brown by his side. "This is your new car," said Scolnik. Brown couldn't wipe the smile off her face, but she did have to wipe away a few tears. "I'm ecstatic," said Brown. "I ain't ever won anything before." Brown got into the car, started it, then started Facetiming on her phone with family members. "Some people are willing to help," said Brown, while she checked out her new wheels. "Sometimes your voice and a for-real story help." For Scolnik, a man who represents 19,000 people as a county commissioner, is more than overwhelmed and thrilled to focus on and help just one. "I hope she's super happy," said Scolnik. "She needs a car and I know this will help her." If you know of a story that should be featured on "Our Michigan Life," send a detailed email to Brent Ashcroft at life@13OnYourSide.com. Follow us on Facebook,Twitter, Instagram and YouTube. Have a news tip? Email news@13onyourside.com.